Cordova, Alaska by motorcycle (and boat and train tunnel). 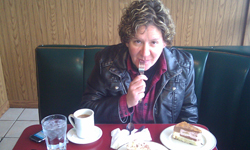 Well, I am behind again as usual in posting my blog. Keeping up with posting on the road is a challenge, either because of lack of connectivity, or being too damned tired to do anything but face plant at the end of the night. I finally got to travel the road less traveled (literally) and visit the Copper Highway north out of Cordova, Alaska. Of course, it is less traveled because there is no road to Cordova. 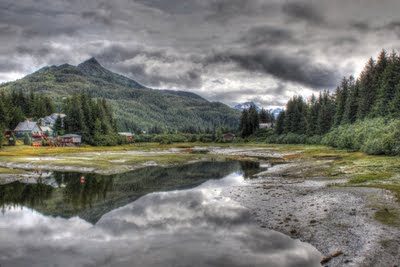 Cordova is a small fishing village located across the Prince William Sound from Whittier. It was one of the communities hit the hardest from the Exxon Valdez oil spill. The Copper Highway was built to service the railroad from Cordova to Chitina in 1945. The construction included the first bridge to nowhere along the rail-bed, also known as “The Million Dollar Bridge.” The 1964 earthquake took out a section of the bridge, making it impassable until 2005 when the state of Alaska repaired the section. Today, the rail-bed has been converted to a dirt road that travels 50 miles into the heart of the Copper River Delta and passes too many glaciers to count. The Copper Highway is one of only four roads left in Alaska (off the main road system) that I have not traveled. The road to Manley Hot Springs, the entire Petersville Road, and the Dalton are the remaining three. Getting to Cordova is a challenge. Jaz and I took a Friday off a couple of weeks ago and headed south to the Whittier tunnel. 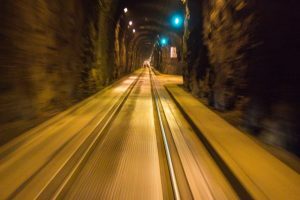 The Whittier tunnel, on a motorcycle, can be a frightening experience. The tunnel was originally constructed in 1941 to service a train-only passage. The tunnel is narrow, with a single track laid in the middle and runs for 2.5 miles. Today, they have laid down metal grating between the rails to allow cars and motorcyclists to travel through. Because the trail still uses the rails, motorbikes must straddle this 2.5 foot wide metal grating between the deep rail gullies the entire length of the tunnel. The traffic brings in rain (a usual for Whittier) making it slick. It is dark, cold, and mesmerizing. Additionally, there are large blower fans to move the car fumes out. The fans have been known to frighten less steady-handed motorcyclists into the rails. This morning, both Jaz and I were apprehensive about the tunnel. We both emerged into Whittier with cramped hands from white-knuckling the ride. Once in Whittier, we put the motorcycles on the Alaska Marine Highway fast ferry – Chenga bound for Cordova. The three hour boat ride through the sound was calling for six foot waves across the sea. Great! I get sick in tranquil seas. 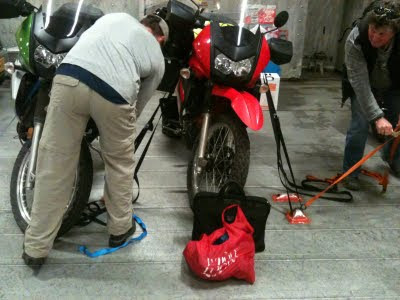 We brought tie-downs to secure the bikes for the boat ride. We rolled into Cordova three hours later and checked into the Cordova Rose. This abandoned barge-turned-B&B, is located on the beaches just south of the town. The barge is a stone’s throw from the ocean. So, when we were not riding the highway or walking into town, we were exploring the property and enjoying the sculptures and miscellaneous fishing items strewn about. The B&B was not in town and a taxi in Cordova is a dicey proposition. The one and only cab driver is a fisherman, so if the fishing is good, then the cab service is not. The fishing was good. We walked into town to have dinner and drinks at The Reluctant Fisherman. They serve a mean Cordova Cosmo that I highly recommend! Stay away from the pilot bread! Cordova is a nice little fishing town with a fishing problem. Walking back, three Cosmos later, was… interesting. The next day we were going to travel the Copper Highway! Part 2 – Cordova to come…. Learn why I jumped so fast your head would spin! Interesting to see the other side of the Cordova journey. Great pics from the barge and in the tunnel.